Love comics and manga? Great, you’re not alone. Despite–or perhaps because of–their popularity with the general public, graphic novels have often lagged behind the giants of quote-unquote “high art.” No one would think to group the Mona Lisa with, say, Calvin and Hobbes. That is, until now. Bande dessinée, the French term for graphic novels, is recognized as the “ninth art” (along with architecture, sculpture, painting, music, literature, plays, film, and media arts). And a special exhibit from the 200-year old Louvre Museum itself, the giant of giants in the art institute world, is playing with graphic novels in a completely modern way. Louvre No. 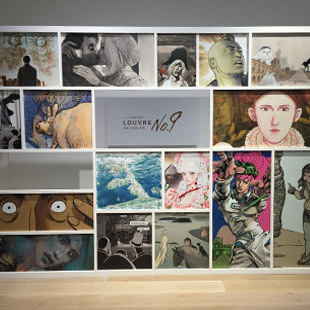 9, a special exhibition from the Louvre Museum now on display in the Mori Arts Center Gallery, showcases the work of sixteen graphic artists from Japan and France. Setting their imaginations loose in the Louvre, they have come up with diverse and irreverent narratives that play with the Louvre’s historic collections in beguiling ways–blown up and in full color. The exhibit begins with a charmingly animated video describing the status of bande dessinée as ninth art and some of the history of the Louvre. The top-hatted, bespectacled old man who narrates the video becomes the mascot who points us through the next three galleries. 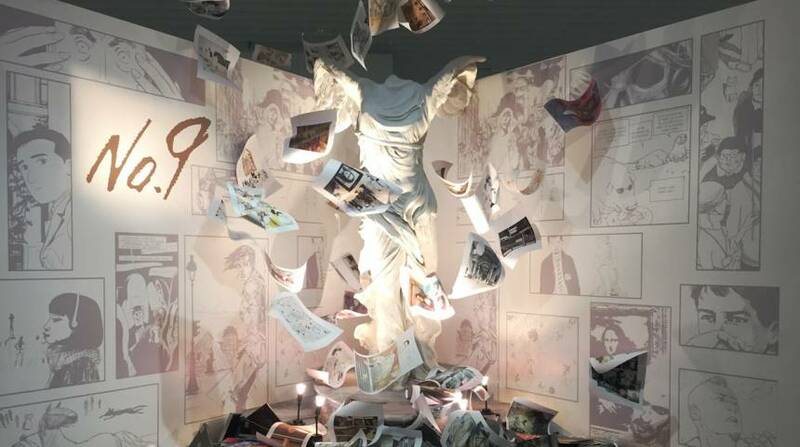 The first, The Great Louvre, showcases graphic narratives with a focus on the face of the Louvre. The second gallery, Welcome to Parallel Worlds, perhaps can’t help but bring up Alice in Wonderland flashbacks with its setup of black and white tiles and mirrors. Its stories explore the hidden or underground sites of the Louvre, away from the public face. The last gallery, Beyond Time and Space, draws together narratives from the past or potential future of the historic museum (and when we say potential future, we’re talking future ice age). Highlights include David Prudhomme, whose visual treasure chest Cruising Through the Louvre situates the spectators of landmark paintings in poses strikingly similar to the paintings they’re viewing. Marc-Antoine Mathieu’s The Museum Vaults: Experts from the Journal of an Expert follows an art assessor in a parallel Louvre going down an endless series of basements housing the museum’s collections, like something out of a Borges or Kafka story. 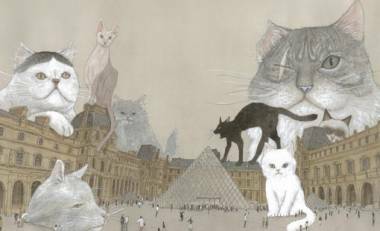 In The Louvre’s Cats, Taiyou Matsumoto (of Tekkonkinkreet fame) follows the lives of three cats that hid in the Louvre and observe–and judge–the thousands of spectators. (“Why are they always taking pictures of that one?” one disdainfully asks, indicating the Mona Lisa). 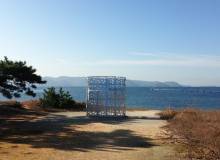 Big names such as Hirohiko Araki, Enki Bilal, and Nicholas de Crécy round out the bill. 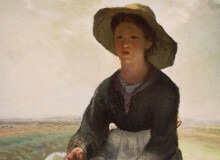 An engrossing exploration combining eclectic narratives with dynamic art styles, Louvre No. 9 takes the lofty masterpieces of ancients and reinterprets them in new and enchanting ways. The ninth form may be the last to join the ranks of the arts, but it proves itself to be by no means the least.